Protesters against the Dakota Access Pipeline are shocked over bills introduced by GOP lawmakers which would criminalize road protests, restrict what protesters can wear, and allow the federal govt. to be sued to cover enforcement costs. Among the bills, one would exempt drivers from liability if they unintentionally injure or kill a pedestrian obstructing traffic on a public road or highway. GOP Rep. Keith Kempenich crafted the driver exemption bill after his 72-year-old mother-in-law was blocked by protesters waving signs on a roadway. “They’re intentionally putting themselves in danger,” Kempenich said of the protesters. Another bill would make it a crime for an adult to wear face masks. State Republicans said the bills introduced last week were motivated by residents’ frustration with the ongoing protests in the southern part of the state which at times saw a thousand-strong encampment opposing the building of the $3.8 billion four-state pipeline. Another bill would require the state attorney general to sue the federal government to help cover some of the more than $22 million in state law enforcement costs incurred since the protests began last summer. There have been nearly 600 arrests in the region since August. The bills were also drafted without consultation with the Standing Rock Sioux Tribe, according to the tribe’s chairman Dave Archambault II. The proposed legislation comes just over a month after the US Army Corps of Engineers denied Energy Transfer Partners, the Dallas-based company funding the pipeline project, a permit to cross the Missouri River, plus a notice that the agency will conduct an environmental review of the site. 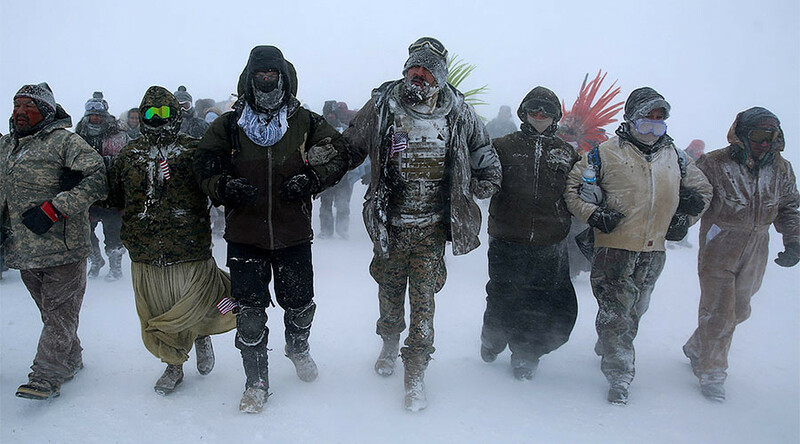 “It’s shocking to see legislation that allows for people to literally be killed for exercising their right to protest in a public space,” Tara Houska, national campaigns director for Honor the Earth, a nonprofit organization focused on indigenous environmental justice, told NBC. The bill will be heard by the North Dakota House Transportation Committee on Friday.